Monster waves of light; tomography on steroids; static standards. 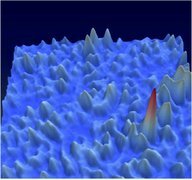 The FOM Institute AMOLF has observed what researchers call monster waves of light. In this phenomenon, monster waves of light appear from nowhere and then disappear again. Researchers have shown that it is possible to influence the probability of this phenomenon. As a result, the technology could lead to faster telecommunication systems or more sensitive sensors, according to the FOM Institute AMOLF. This is one of the research laboratories of the Foundation for Fundamental Research on Matter (FOM), part of the Netherlands Organization for Scientific Research. Researchers transmitted light flashes via a single channel into the optical cavity. Light escaped from the other side of the cavity. All told, at random positions, researchers saw large peaks of light intensity, which are considered monster waves. The current metrology and inspection tools are capable of measuring structures in two dimensions, and in three dimensions to some degree. But that is not nearly good enough for the next wave of chips, LEDs and solar cells in the marketplace. The industry wants tools that can measure structures in three dimensions. In what could solve part of the problem, Stanford University and the FOM Institute AMOLF have developed a new tomographic technique—cathodoluminescence spectroscopic tomography. Tomography is a technology that enables a tomogram, which is a two-dimensional image of a section through a three-dimensional object. This is done by moving an X-ray source in one direction. Then, an X-ray film is moved in the opposite direction. Cathodoluminescence is an optical and electromagnetic phenomenon. In the technology, electrons hit a luminescent material, causing the emission of photons. In any case, tomographic techniques that rely on optical excitation or detection are limited in their resolution by diffraction, according to researchers from Stanford and the FOM Institute AMOLF. To overcome these issues, researchers have combined two technologies–cathodoluminescence and tomography. The technique can probe optical properties in three dimensions at nanometer-scale resolutions. In the lab, researchers started with a gold-coated crescent at 250nm in diameter. Researchers first imaged the structure with a scanning electron microscope. The beams passed through the object, causing it to emit photons. Then, researchers tilted the structure and re-scanned it. By combining this with tomography, researchers created a three dimensional map of the structure with a spatial resolution down to 10nm. “This work could enable a new era of 3D optical imaging with nanometer-scale spatial and spectral resolution,” said Jennifer Dionne, an assistant professor of materials science and engineering at Stanford, on the university’s Web site. The ESD Association and the JEDEC Solid State Technology Association announced a new standard for component-level, electrostatic discharge sensitivity testing for the charged device model (CDM). The groups also announced the publication of the new standard, dubbed ANSI/ESDA/JEDEC JS-002-2014 for Electrostatic Discharge Sensitivity (ESD) Testing – Charged Device Model (CDM) – Device Level. The new standard is intended to replace the existing CDM standard. The new standard is expected to improve the procedure for testing, evaluating and classifying components and microcircuits according to their susceptibility to damage or degradation by exposure to a defined CDM-based electrostatic discharge (ESD).